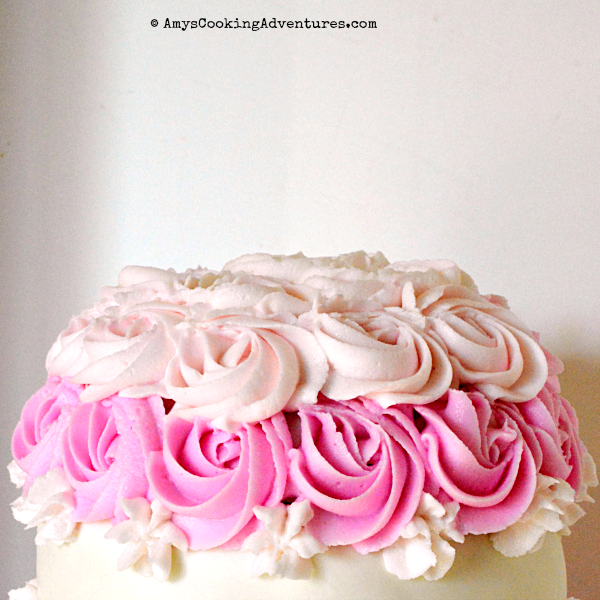 This stunning Buttercream Roses Vanilla Cake is only the top tier of a beautiful birthday cake! It’s time for this month’s Food ‘n Flix recipe! 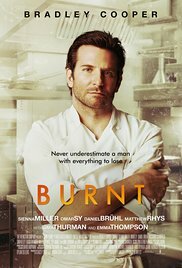 This month’s movie is Burnt hosted by Caroline at Caroline Makes. In the movie Adam (Bradley Cooper) is a classically trained chef who was ruined his career with drugs and childish behavior. After cleaning himself up, he goes to London to reconnect with some chefs he’d worked with before he ruined his career to reestablish his reputation and seek his third Michelin star. The movie follows the fast-paced, cut-throat career of the restaurant industry. There are long, hard hours. Underlings yell “yes chef” no matter how absurd the request. I thought this was a great movie, though it also reaffirmed that I am perfectly happy being a home chef and food blogger. I would not like the life of the chef! There is food inspiration galore in this movie. I could have made literally anything and found a way to tie it into the movie. The food ranges from breakfast foods to street food. From gourmet to Burger King and everything in between. My inspiration struck, however at a scene about half way through the movie. The saucier is a single mom who wants to take the day off for her daughter’s birthday. Her request is rejected, so she brings her daughter to work and demands a birthday cake. After some reluctance, Adam makes a gorgeous cake for the birthday girl. He cuts her a slice and sits down with her. Then she claims, “I’ve had better”. Haha – leave it to a kid! So (obviously) I decided to make cake. In fact, this movie and inspiration coincided perfectly with a much larger cake project I had coming up, so this is only the top tier of a much larger cake (you can check out all the details about the Princessthemed cake and my first time stenciling on a cake here). 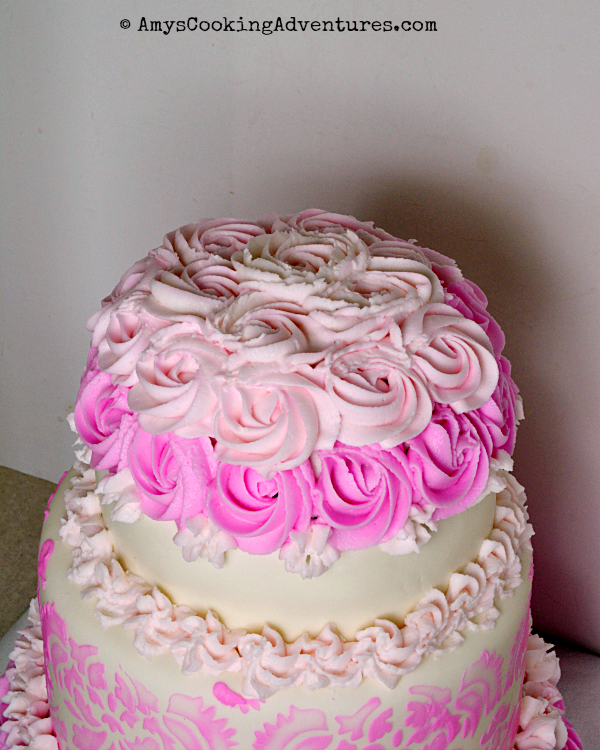 For the larger cake, the request was that the cake be big, pink, and princessy. So I thought buttercream roses would absolutely fit the bill! Preheat the oven to 350 degrees F and spray two 8-inch pans with non stick spray or line muffin tins with paper liners. For this cake, I also greased a small, oven safe bowl with spray. Mix all of the cake ingredients in the bowl of a stand mixer until smooth. Divide the batter evenly between the cake pans liners and bake for 25-28 minutes, adding more time as necessary if using cake pans. Cakes on done when a toothpick inserted into the center comes out clean. Cool completely before frosting. To make the frosting, place all frosting ingredients into the bowl of a stand mixer. Mix until smooth. Add pink food coloring, if desired. 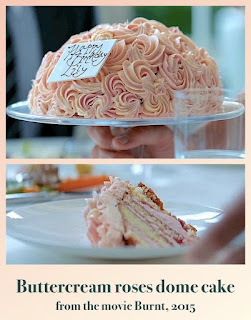 Frost the cake with a thin layer of buttercream. 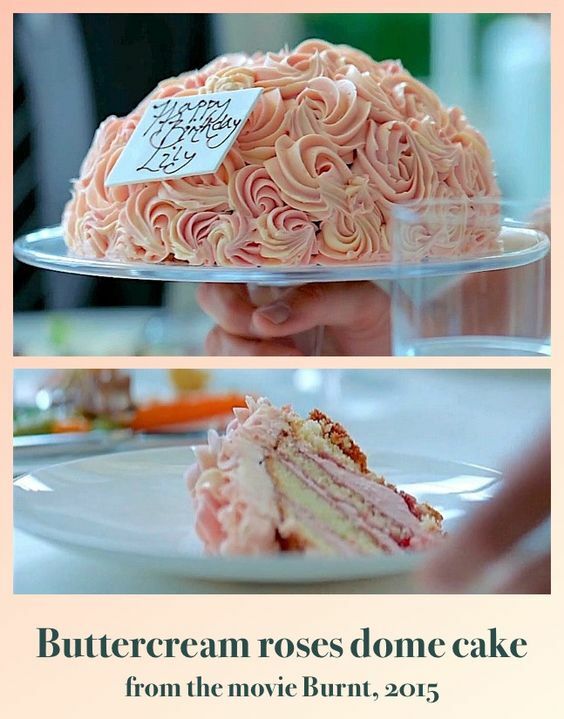 Load a piping bag fitted with a 1M tip and frost the entire cake with buttercream roses. SO pretty! 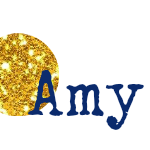 Great job, Amy! I loved this movie too, Amy. We had seen it at the theater when it first came out and I was excited to watch it again. Your cake is absolutely gorgeous. What a lucky little Princess. Such a beautiful cake, and I loved that scene! Gorgeous. I have to admit as a veggie I was struggling to find inspiration from the film and the cake was the only thing that called to me, but then something dawned on me - so i am Still hoping to join in. Now please give me a slice of cake, pretty please. Your frosting skills are magnificent! This is amazing! OMG, Amy. That cake is totally amazing and I think it looks better than Jones'. I loved that little precocious kid in the movie!